Sliced smoked sausage roasted together with potatoes, onions, spices, and topped with a light sprinkling of cheddar cheese. Today I have a quick and easy recipe to share that's also the perfect one dish meal. 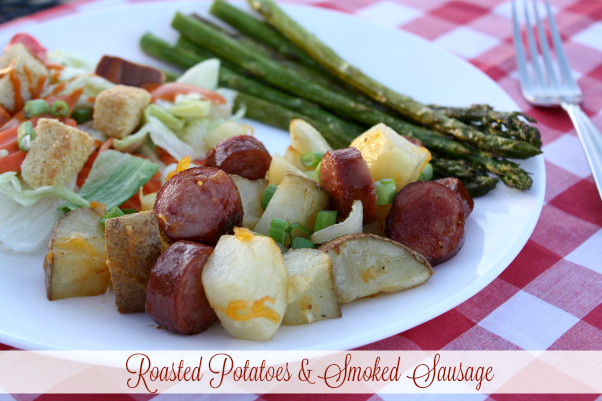 Smoked sausage is my youngest sons favorite, so I'm always on the look out for new recipes. 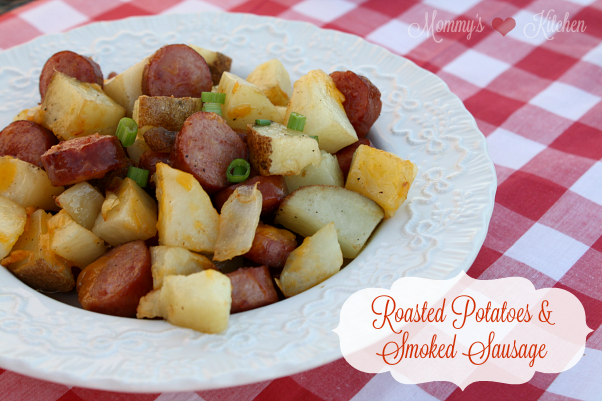 This recipe for Oven Roasted Potatoes & Smoked Sausage was one that I found on Pinterest via Recipes from The Big Blue Binder a couple weeks back. This recipe is super simple to make and perfect for those nights when you still want a home cooked meal, but it needs to be quick and easy. I also love that everything is roasted together in one pan. 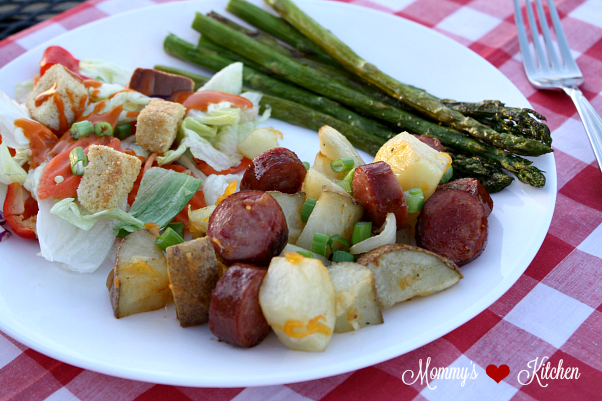 Serve with your favorite veggie and a garden salad to complete the meal. At first I wasn't sure if my son would like this recipe or not. Carson loves smoked sausage and he loves potatoes, but he's one of those kids that doesn't like certain foods mixed together. I was shocked when he ate three servings and gave me a thumbs up. I am so glad he is finally growing out of that picky eater stage. I hope y'all enjoy the recipe as much as we did. Preheat oven to 400 degrees. Line a large rimmed baking sheet with aluminum foil, and drizzle with a bit of olive oil and set aside. In a large bowl, add the sausage rounds, potatoes, and onions. Drizzle the mixture with a couple tablespoons of olive oil, and season to taste with kosher salt, pepper, fresh or dried thyme, and creole seasoning. Toss the mixture together until blended and pour out onto the baking sheet. Spread the mixture out as evenly as possible. Place the baking sheet into the oven and roast the mixture for about 45 minutes, turning every 15 minutes or until the potatoes are golden brown and tender. Turn off the oven. Remove from oven and scatter the shredded cheese over the mixture, put the baking sheet back into the oven for about 5 minutes until the cheese melts.